Andrew Francis, Culture and Commerce in Conrad’s Asian Fiction. Cambridge: Cambridge University Press, 2015. 245 pp. £64.99/$99.99. It has taken a very long time to de-exoticize what F. R. Leavis dismissed as Conrad’s “excessively adjectival studies in the Malayan exotic” and to anchor these works in a historical world. 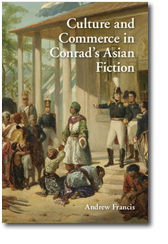 Thanks to Andrew Francis and other recent scholars, Conrad’s Asian fictions can now begin to be read as political and social novels, as studies that can contribute to our understanding of the history of business and globalization in Southeast Asia, and as ironic explorations of the pervasive impact of commerce on all aspects of human life. The volume opens with a concise survey of colonial trade in Southeast Asia. The free port of Singapore, where British trade is based, is contrasted with the monopolistic and managerial traditions of the Dutch; and the histories and practices of other non-European trading cultures are also sketched: Arab, Chinese, Bugis, and Dayak. The Asian works are then considered in the order of their composition. Almayer’s Folly is an ambiguous portrait of an incompetent trader living “on the edge” in many ways, whose obscurity can be understood in terms of the various networks of trade in which his fate is entangled. Of An Outcast of the Islands Francis observes that “The novel abounds in traders” (51), among them “the most notable businessmen in the Archipelago” (53), from Hudig and Abdulla to Lingard and Sahamin. All of these businessmen, whether Muslim or non-Muslim, European or non-European, are “complicit in transgressive commerce,” while Almayer himself “personifies commerce’s potential for the generation of instability” (54). The colonial gardens at Buitenzorg, the setting of Almayer’s childhood, receive special attention for their relevance to the commercial development of the colony, and the mixed identity of Willems’s wife Joanna is examined in the context of racial groups struggling on the margins of commerce. Although Francis agrees with the critical consensus that The Rescue is not a “success,” he calls attention to its “political and social scope” and argues that the stranding of the yacht near the Shore of Refuge “realizes the history of European colonialism and commerce and the advent of modern globalization, and interrogates their consequences” (66). Despite its weaknesses and Conrad’s difficulties in writing it, the novel shares with Nostromo an ambition to analyze the commercial, social, and moral relations among local populations and European interlopers. A masterful chapter on Lord Jim concentrates on the latter half of the novel and re-opens the question of the real-world location of Patusan. Francis notes many similarities between Patusan and Sambir (Berau, in eastern Borneo) in terms of their commercial and cultural relations. The admirable character of Stein reminds us that Conrad was not always ironic and critical of empire; Stein’s generosity, his scientific curiosity, and even the design and furnishings of his house show that good businessmen can also be good men. Jewel’s family history also receives attention in the context of the traditions of concubinage that were common in the colonial East Indies, at first tolerated and even encouraged by the Dutch authorities but then increasingly frowned upon as more Dutch women arrived in the colonies once the Suez Canal was completed. The chapters on “Falk,” The Shadow-Line, and “The End of the Tether” bring into relief the rapid changes affecting trade, and contrast the encyclopedic knowledge of older skippers with the survey maps, log-books, directories, insurance policies, and various complicated forms of ownership that characterize the modern world of commerce. Francis shows how Conrad dramatizes the ways in which various forms of capital penetrate the Eastern world, reducing the former freedoms of the seas to an increasingly regulated and documented existence. For example, the financing of steamships and steamship fleets requires the formation of joint stock companies, so that ownership is separated from management and captains are reduced to the status of employees. Francis examines Captain Whalley’s efforts to use “the legal and commercial tools of the age to secure his daughter’s inheritance, ironically by means of the very society and commerce of which he no longer feels part” (157). In the chapter on Victory, Francis examines the commercial history of coal mining and the Tropical Belt Coal Company in relation to the then-new idea of “limited liability” and the scandals attending the collapse of The Eastern Archipelago Company, which was established in 1848 in Labuan to supply steamers with coal halfway between Singapore and Hong Kong. Francis has a fine eye for detail and observes the many ways in which Conrad mines the discourse of commerce for metaphors and ironies at the most personal levels of human relationships. Almayer, for example, is offended that Reshid wants to “buy” Nina, yet he has effectively sold himself to Lingard by marrying a Sulu woman and expects that in Amsterdam his wealth will smooth his half-caste daughter’s path into society. The non-European characters, being poorer, are relatively less corrupted by the language of capital, and provide Conrad with a rich source of irony. A number of shorter works are also discussed in the form of brief afterthoughts to the major chapters. “Freya of the Seven Isles” is thus appended to Almayer’s Folly, “The Lagoon” and “Karain” to The Rescue, and “Because of the Dollars” to “The End of the Tether.” In the texts and footnotes, Francis engages in a judicious dialogue with scholars and editors, past and present, who have commented on the ways in which colonial trade is represented or reflected in Conrad’s works. Thanks to his business experience and wide reading, Francis is able to complement and refine their observations with the help of a great many outside sources: not only works of Conrad scholarship, but also official records, memoirs, letters, newspaper articles, directories, and nineteenth-century books on botany and banking. The ample Bibliography is prefaced with a note that “Some 500 additional items consulted for the writing of this book but not cited” may be found in the bibliography of his doctoral thesis (Cambridge, 2010). Francis expresses his claims modestly, but like the “certain wise bankers of circumspection and probity” with whom he trained, he reads deeply and writes “with care and enquiry” (ix). This handsome volume lays a solid and useful foundation for future scholars to build on, and makes a compelling case for the further elaboration of Conrad’s “poetics of commerce” (193) and for comparable readings of non-Asian fictions like “Heart of Darkness,” Nostromo, The Secret Agent and Chance in terms of the history and the discourse of business.